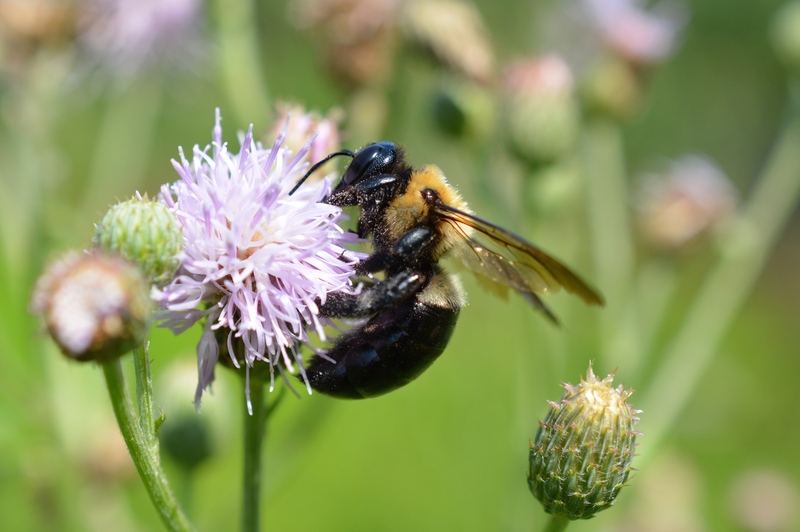 Our largest native bee, the large carpenter bee is troublesome to property owners when making its nest holes in the wood of barns, porches and other structures. Fortunately, nest holes are not structurally damaging. If deemed a nuisance, this bee can be deterred with heavy coats of varnish or paint applied after the bees emerge or before they are attracted to untreated wood. This bee is often confused with bumble bees, their abdomens are practically hairless unlike fuzzy bumblebee. This solitary bee is not aggressive even though males will dive bomb an unsuspecting passerby; bluffing a mock attack. Only female bees have stingers (an adaptation to the ovipositor) while the males are harmless. This solitary bee produces the largest eggs in the insect world; each about a half inch long and each female only lay up to 8 eggs in her lifetime. They are active pollinators though often steal nectar by chewing a hole through a flower. The dark metallic blue small carpenter bee (Ceratina spp.) with a relatively hairless, ant-like body should not to confused with the more notorious large carpenter bees (Xlocopa spp.). The smaller bee doesn’t have the jaw strength to burrow into wood like its larger relative. Instead it opts for the pithy centers of dead stems of elderberry, box elder, sumac and blackberries. The female lays her eggs in a linear series of brood cells that are partitioned with chewed pith and saliva. Small carpenter bees are long lived; up to one year. Unlike other solitary bees, the female bee actively manages her brood by sitting guard against predators in the entrance of the stem until the new generation emerges. The brood consists of up to 11-12 brood cells provisioned with “bee bread”. The new generation of adults may either overwinter in the natal nest or disperse to find new hibernacula. 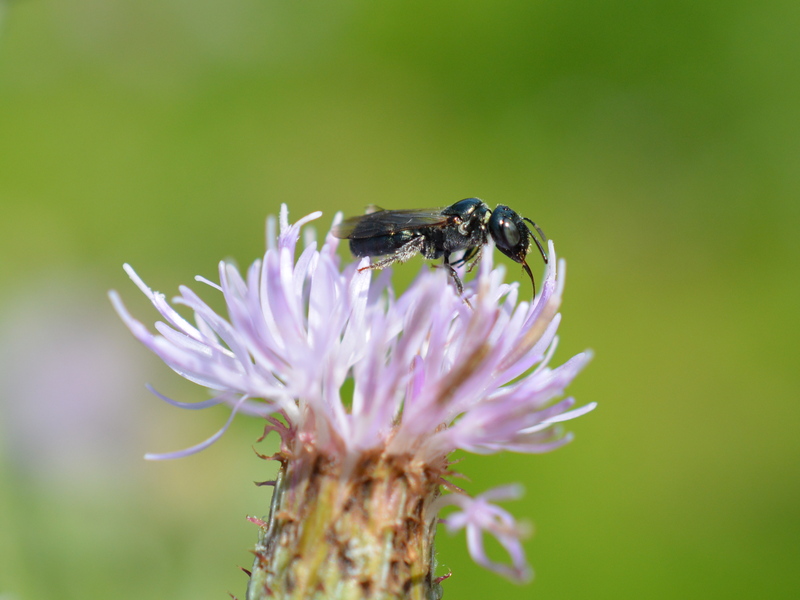 Small Carpenter Bee on Thistle.